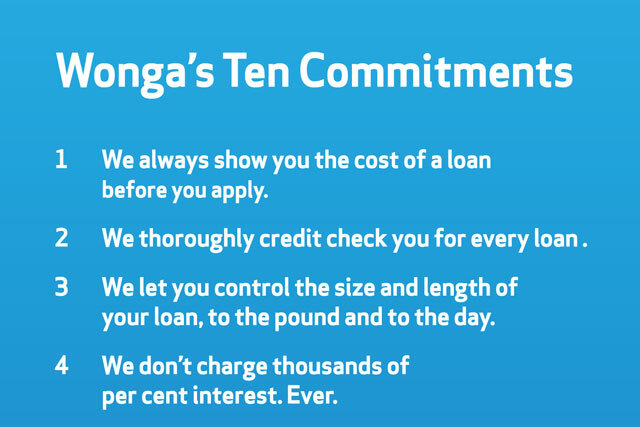 Wonga has issued a further riposte to the Archbishop of Canterbury, after he said he would "compete" the payday loan firm "out of existence", with the launch of an ad campaign promoting its 'Ten Commitments'. The work, which rolled out across national press today, comes as Archbishop Justin Welby admitted his "embarrassment" at discovering that the Church of England had indirectly invested £75,000 in the foundation of Wonga through its pension fund. 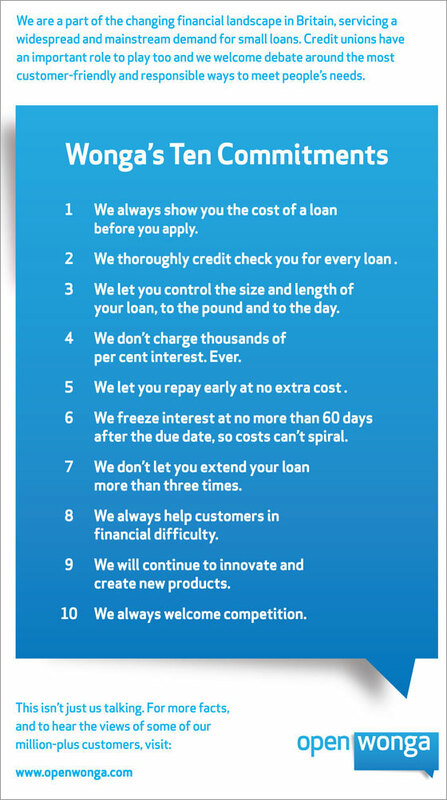 Wonga's Ten Commitments campaign is stark in its execution – the commitments are printed in white lettering on a bright blue background. It is both a tongue-in-cheek jibe at Welby as head of the Church of England, with its play-on-words reference to the Ten Commandments, and an attempt at making serious points and staving off the negativity surrounding payday loan schemes. The commitments include, "We always show you the cost of a loan before you apply", "We don’t charge thousands of per cent interest. Ever", "We always help customers in financial difficulty" and "We always welcome competition". Wonga said in its OpenWonga blog that it had decided to create the work after Welby’s vow to "compete Wonga out of existence" was "interpreted by some as meaning we are an unacceptable business". The blog said: "Some have taken it a step further, saying we make unaffordable loans to the most vulnerable in society. We respectfully disagree." This week, The Archbishop of Canterbury told payday loan company Wonga that the Church of England would "compete you out of existence". Wonga founder Errol Damelin issued a statement in response saying he "welcomes competition".